It's a pain to host a giveaway on Facebook, so the "A Quilt Block a Day" Facebook page giveaway will be on this blog. We're celebrating 3000 (plus!) "Likes" on the page. Can't find time to make a quilt? How about a block each day! Every season I'll showcase a new block and post a tutorial on my blog 52quilts.com. No, you don't have to follow "52 Quilts" to win the giveaway! And you don't even have to "Like" the "A Quilt Block a Day" page on Facebook! In fact, you don't even have to use Facebook! 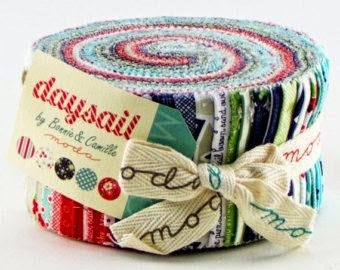 It's a jelly roll of Bonnie & Camille's new line, "Daysail." It's what I'm using to make the May Jelly Roll Party sample. Of course, I'll include some extra goodies in the prize package -- but that will be a surprise! Comment on this blog post. Tell me if you've visited "A Quilt Block a Day" on Facebook. Giveaway ends Saturday, March 7 at midnight Mountain Standard Time. The winner will be announced on Sunday, March 8. I hope you'll come back tomorrow for the UFO Parade! Since I am not a Facebook user I have only seen these lovely fabrics on your blog. Thanks for the chance to win them. I am a follower on facebook! Congratulations on reaching this milestone Marti! Thanks for the opportunity to win this beautiful fabric! I haven't visited "A Quilt Block a Day" yet but it sounds interesting so I will now. I just checked out the facebook page and I liked what I saw, although I can't "like" the page as I am not a facebook user. Congratulations on your milestone! I'm not on Facebook but still looking forward to your quilt block a day, Have learned a lot from your blog! I am not on FB often, so I may have missed the 'Quilt Block a Day'... Sounds like a great way to get something accomplished without a big commitment!!! I'm making a note to check out your block a day FB page (I really only use FB for those time sucking dumb games!) Love your blog, though. I'm already liking you on Facebook. Congrats on 3000 likes. And thanks for the giveaway. I follow A Quilt Block A Day on Facebook. I'm working in my Log Cabin Blocks daily. I'm a few weeks behind, but enjoying it. Congrats on 3000 likes! Yes, I visited and liked you on FB. Love the log cabin quilt from Quilt Expressions that you posted. Thanks for the giveaway. I follow on Facebook ( Rhonda Gaines Desgranges). Yep, I have your FB page liked, too! Fun to follow! Another terrific giveaway, I don't know how you keep up with it all! I've visited Quilt Block a Day on Facebook. One day I'll even join in! I am a follower on Facebook. Love! Thanks for the giveaway. I have visited A Quilt Block A Day on Facebook. Congratulations on 3000 Likes!!! thank you for the very nice giveaway opportunity. I don't use Facebook so didn't view the info. It sounds like it will be posted on your usual blog so I'll wait to read the info. there. I am familiar with the format and have followed the progress for the past two block a day quilts. Thanks. I follow you on Fb, but when I visited your Fb page, I couldn't find the Block-a-day page. I've followed (but not joined in, alas) the progress here on your blog. I had a look at your facebook-page and I know some people here in Germany, who male a bock a day! Another wonderful giveaway!! I've visited Quilt Block a Day on Facebook. I'm not a Facebook user, so I haven't visited the Facebook page. Thanks for giving us all an opportunity to win! I do not have FB. Thanks for the awesome giveaway! I am glad you are doing this giveaway via your blog because I don't have a FB account. Thank you so much for the chance. Love the aqua. How exciting! I am enjoying the UFO challenge, but I'm up for a block a day too! Congrats on the 3000 likes! I don't play along with a block a day because I have too many other projects screaming for my attention but I do love to follow along and see how things are going. I love your blog and Facebook. I'm doing the Block a Day. My favorite so far is the star block quilt. Everyone wants one now. It's great that the points won't get cut off. Bonnie and Camille's fabrics rock. Thanks, I would love to win it. I love this fabric and just went to your Facebook page. Your Block-A-Day is such a great idea! I will be checking this out regularly. Thank you! Yay on your 3000 likes. Visited your facebook page as well. Love your blog and all you share with us. You have inspired me to do more even in a short amount of time. Thanks! Since I am not a Facebook user I have only seen these lovely fabrics on your blog.Congratulations on reaching this milestone Marti! I did visit and gave the page a like. I have three quilts in progress. I need to start getting them finished up! Congrats on your milestone reached. I follow your blog via Bloglovin but I am not a Facebook user anymore so have not seen your page on FB. I have not been to your Facebook page yet, but I am on my way! Thank you for your giveaway. 3000 followers is quite a thing to celebrate! What a wonderful jellly roll!! Vibrant colors for a great summer quilt. I have visited on FB. Thanks for a chance to win! Love those prints. I just visited on FB. One of my favorite new collections is "Daysail", so fresh and original. Thank you for a chance to enter this generous giveaway. I have visited A Quilt Block A Day on Facebook -- I look forward to exploring more!!! "Daysail" is lovely -- hopefully, Spring is right around the corner!! I have not visited on Facebook. I still tend to read more on blogs as my Facebook page is clogged with all sorts of stuff. I visited and liked your FB page. I don't do much on FB, but I have a few closed groups that I joined and that's why I check FB sometimes. There's not enough time in the day to FB, blog, sew and knit, LOL!!! The giveaway fabric is pretty and I will take a look at your quilt blocks too. I have visited on Facebook and I am a follower there and by email. Thank you for the chance to win a great prize. Have a wonderful day. Yes, I have visited A Quilt Block a Day on FB, as Kathy Newsom Davis. I didn't know about the FB page, but I really only use facebook to keep up with old friends. I prefer the blogging community for all things quilty. Thanks for the heads-up! I don't do alot on Facebook but I have "liked" your page for awhile now! I really ilke your blog! I have visited A Quilt A Day, currently following to see what they post. Always love a new fabric fb page. So nice to see all the pretty fabric on my feed. Always brightens a difficult day. I'm not on facebook, so, no I haven't visited. Look forward to your posts. You are always inspiration for me. Hi Marti - following you here and on facebook! 3000 followers is awesome! Thank you for the giveaway!! I follow on your blog and FB too. I've been following your blog and now the FB page. Great giveaway, thanks. I love your blog and also your FB page! Thanks for this terrific opportunity! Congratulations on making that milestone on facebook! I canceled my facebook account about a year ago so haven't had a chance to visit your page. Thanks for the great giveaway and the chance to win. Thank you for the chance to win, even though I'm not a facebook user. Seems like we are left out if we decline that site. So, thanks for the opportunity to win the beautiful fabric. I want to try a quilt technique I saw on PBS. Congratulations on your milestone! I can understand why - you are an inspiring quilter! Yes, I like a Quilt Block a Day on Facebook! Thanks for the fun! FB page looks great. Love the ideas. Thank you! I "liked" your FB page and am signed up for notifications. A block a day sounds awesome. Am an Arizona winter snowbird and will head home to Canada at the end of the month. I do more quilting in Canada because the spring weather will be wet and dreary whereas here in Arizona it is so nice all the time, quilting has to wait! I've been following your blog and FB pages for some time. Love the inspiration! Thanks for the giveaway. I visited you on Facebook and I'm a fan too. I love this approach to quilting. Congratulations indeed on such a number! I admire your fortitude and creativity. I signed up on Facebook as I am always looking for new ways to share in the quilting community! Liked you on Facebook. I saw the picture of Samosa when he was a kitten ... soooooo cute. How is he doing today? Still a cuddler? Congratulations on 3,000 likes on FB! Thanks so much for the opportunity of the giveaway! I just love the daysail line. Visited Facebook! I visited A Quilt Block A Day on Facebook and "liked" it! Thanks for the giveaway. What a great idea! Congratulations on 3000! Congratulations! I have visited you on FB and am a new follower. Thanks for the giveaway! CONGRATS ON 3000+ ! Happy to follow>Blog lovin' ! THANKS for sharing a neat Jelly Roll Giveaway! 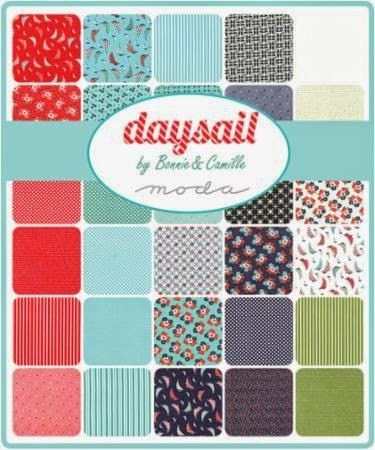 Love "Daysail" and know it would make a darling quilt! Happy Stitching ! I have not been to Quilt Block a Day on FB, but I'll check it out. Yes, I've 'liked' you on Facebook. And I DO like you! Thank you for the opportunity to win the Daysail Jelly Roll - very fun! I visited Quilt block a day on facebook and I watched your tutorial of the magic binding. I must give that a go as it looks terrific. I haven't checked Facebook for the site yet, but I will now! P.S. How do you tell if you are a no reply follower? I read your blog and FB page, and really appreciate getting replies from you when I do comment. Thanks for the opportunity to win. I visited! Thank you so much for the chance to win! I don't do Facebook so haven't seen the page, but I have been reading your blog posts with the quilt block a day. Thanks for the giveaway! I just "liked" your FB page. Congrats on the 3000 likes! I enjoy your blog and thanks for the giveaway. I love all of Bonnie and Camille's fabrics. Hi Aunt Marti, I've not been active on FB for quite some time until about a week ago. If I decide to stay on there, I'll go check out your page. Thank you for the fun giveaway! I love Block A Day on FB and visit often. Thanks for another great giveaway! Yes I've been to your FB page and have liked it. I follow A Quilt Block a day, nice idea but hard for me to do. I can imagine how neat it would be to have 365 blocks. Great blog and great idea to do a block a day. Would love to be the winner of the prize. Long may you continue. Hi, Marti - I do follow your blog and have "liked" A Quilt Block a Day on Facebook. I have taken so many ideas and much inspiration from your posts. Hi Marti, I love your blog. I have been following it for at 2 years now. You have many great tips and tutorials. Just liked Quilt Block a day on facebook. I can always use fabric. I love ready your blog. I don't do Facebook so I haven't checked out the page, I read here though. Congratulations on 3000 likes! I've liked you on FB now... and you can't go wrong with Bonnie & Camille fabrics in my book! I'd love to win this jelly roll, I can think of all sorts of things I'd use it for. I visited the facebook page. And clicked like. Now you have one more. I want that daysail. I am not suppose to buy fabric until I use more. But I could win some. Yes I visited the page! I would love to win this prize - am new to quilting and simply addicted, would love to win this prize! Let's hope mine is the lucky number! Thanks for the chance to win! I have you on my Kobo reader bookmarked, so I read you all the time! Love the jelly roll! 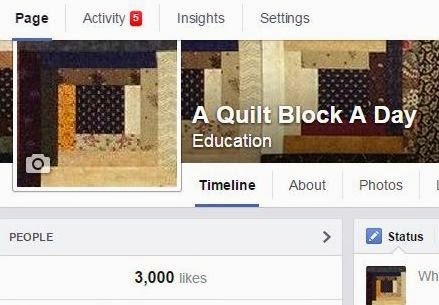 I visited and liked "A Quilt Block a Day" on Facebook. This is a great giveaway! Thank you for the chance and congratulations on the Facebook likes! Daysail! I'm in. I don't use Facebook so didn't visit or like the page. I've never been to your FB before! I'm on my way to check it out now! Thanks for sharing! I visited you on Facebook!!! Happy Quilting! I just visited and liked your facebook page. Log cabins are a favorite of mine! Congratulations on surpassing 3000 likes! I've been to your page a few times. Thanks for the chance to win! I'm not a Facebook user...I've visited your blog several time. Love this line of fabric. Thanks for the chance to win some to sew with. I haven't actually visited the FB page, until today. I gave it a like so I can stay up to date from now on. Thanks for the chance. Congrats on 3,000 likes. That's awesome! I visited the FB page and liked it. I haven't visited "A quilt Block A Day" but I shall right now! I don't do facebook, but I'm enjoying the blog! Thanks for Daysail giveaway! I visited and liked you on Facebook. A log cabin quilt is on my bucket list. I have followed your blog and your facebook page "A Quilt Block a Day" for some time now. Enjoy reading them. Thanks for the chance to win this fantastic jelly roll. I do use Facebook. Love the colors in the jelly roll. I was just looking at Daysail this morning! Love it! I have visited and like your facebook page! Oh I don't use facebook any more, but I do use fabric! Thanks for a chance to win! What a lovely giveaway! I haven't visited your Facebook page. Yet. What a wonderful prize. I haven't looked on Facebook, but will be going there now. Yes, I visited the Quilt Block a Day on FB. I've been a follower on FB for quite a while, and following along with the UFO challenges so far this year! So far I'm 3 for 3! Thanks for all the motivation! I enjoy your blog and Facebook page. I would love to win the roll. I am not on Favebook but enjoy the blog. Thank you! I did visit A Quilt Block a Day and I 'Liked' them. Great log cabin blocks there. Actually, I have visited A Quilt Block A Day on Facebook! I'm sorry not on Facebook but love the blog!! I really like Bonnie and Camille Fabrics. I am not a Facebook person; just blogging keeps me busy enough.